Gravity separation is the oldest known ore beneficiation technique and is practiced extensively in ‘Nature’. Earliest recorded human use of gravity separation was recovery of gold by panning from the Upper Nile by ancient Egyptians, dating back to 1900 BCE. Gravity separation is a physical process which consists of the separation of different mineral types in the ore from one another based on differences in their specific gravities using the force of gravity, which can be influenced by one or more of other forces such as centrifugal force, resistance to motion by a fluid (e.g. air, water) etc. Hence, besides gravity, other factors, such as size, shape etc., also have an influence on the relative motion and thus in the separation. 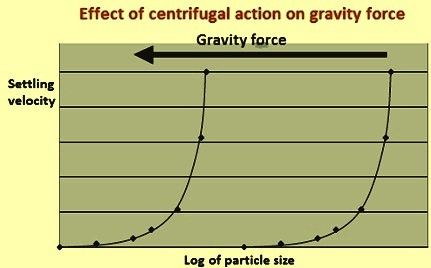 The effect of centrifugal action on the gravity force is given at Fig 1. It can be seen that as the gravity force increases, settling velocity of smaller particles becomes higher. Separation of the ore particle by gravity is dependent on two factors namely (i) settling rate of the particles, and (ii) difference in specific gravity when compared against the medium in which they are being separated, this gives differential settling rate and has been termed the ‘concentration criteria’.Settling rate of a particle is dictated by ‘Stoke law’ and is equal to kd2g(Ds-Df), where k is a constant, d is particle diameter, g is force of gravity, and Ds is the specific gravity of solid and Df is the specific gravity of the fluid medium. The ‘concentration criteria’ (CC) gives an idea of the amenability of separation of two ore particles and can be expressed by (Dh-Df)/(Dg-Df) where Dh is the specific gravity of heavier component of the ore, Df is the specific gravity of the fluid medium, and Dg is the specific gravity of the lighter component of the ore. Generally, when the quotient is greater than 2.5 (whether positive or negative), then gravity separation is relatively easy. With a decrease in the value of the quotient the efficiency of the separation decreases and below 1.25, gravity separation is not feasible. There are several types of gravity separation methods. Major of these methods are (i) jig, (ii) pinched sluices, (iii) spirals, (iv) shaking tables, (v) fine particle separator such as Multi Gravity Separator (MGS), and (vi) gravity/sizing such as hydrosizers and hydrocyclones. Pinched sluice type gravity separators were popular at some places until the introduction of the new generation of spirals. The pinched sluice is basically an inclined slope, over which a slurry containing particles of different specific gravities are made to flow. Because of the occurrence of the gravitational and frictional forces, and a narrowing of the sluicing deck (pinching), segregation occurs with the finer heavier particles migrating to the bottom of the flowing film and the lighter coarser particles to the top. By means of a slot (concentrate off-take) near the end of sluice the fine heavy particles are removed from the light coarser particles stream, which passes over the slot and discharges at the end. There are two types of pinched sluices namely (i) trays, and (ii) Reichert cone. The principles of operation in trays and Reichert cone are shown in Fig 2. Trays came into operation first and have several variations. They normally consist of multiple feed points per unit, with several stages (e.g., rougher/cleaner/scavenger) in each unit. The advantages of trays include (i) open for visual inspection, adjustment and cleaning, and (ii) high feed density (63 % solids) so low volume-pumping is needed. Disadvantages include (i) unwieldy because of large space requirement, (ii) low upgradation ratio (typically 3:1), (iii) controlled specific gravity of the feed is needed, (iv) low recovery of fines, (v) feed needs screening, (vi) low tolerance for slimes, (vii) there are multiple feed points and separating surfaces, and (viii) needs wash water for the density control during cleaner stages. Reichert cones are essentially an improved version of the trays. They are cone-shaped with a central single feed point. Generally they contain multiple stages mounted vertically above each other. The more common configurations are (i) 4DS (four double/single stages), and (ii) 2DSS.DS (two double/single /single stages plus a double/single stage), the first one is used as the roughers while the second as the cleaners. The process variables are (i) feed rate (increased rate reduces performance above an optimum), (ii) feed density (needs to be kept between 60 % to 63 % solids otherwise either recovery or grade suffers), and (iii) insert settings (range 1 to 9 with increasing opening the recovery is more but the grade gets lower). The advantages are (i) high capacity for floor area, and (ii) high feed density (63 % solids) so low volume-pumping needed. The disadvantages are (i) low upgradation ratio (typically 3:1), (ii) controlled specific gravity of the feed is needed, (iii) low recovery of fines, (iv) feed needs screening, (v) low tolerance for slimes, (vi) bottom separating surfaces of cones not visible or easily accessible, and (vii) needs wash water for density control during cleaner stages. Spiral concentrators are used in the processing of ores composed of minerals with different specific gravities. It consists of equipment with flowing film separation. It is basically an inclined chute with a complex cross section wrapped around a central column. The principle is that a combination of gravitational and centrifugal forces acting upon particles of differing specific gravities cause fine heavier particles and coarse light particles to segregate (Fig 3). These forces are greater than in the cone and, coupled with the lower slurry density normally used, produce a greater upgrade ratio than the pinched sluice (typically 5:1) and a better recovery of fines. Spirals are made with slopes of varying steepness, the angle affecting the specific gravity of separation, but having little effect on the concentrate grade and recovery. A spiral unit is composed of a profiled channel swept helically around a central post creating a spiraling trough. Commonly used spirals have between three and seven turns, with a diameter ranging between 0.4 metre and 1 metre. General operation is a continuous gravitational laminar flow down on an inclined surface. The feed mixture is composed of ground ore mixed with water, forming slurry which is gravity fed at the top of the trough. On its way to the bottom of the spiral, the denser particles generally reports inward while the less dense particle normally flow towards the outer part of the trough. The mechanism of separation involves primary and secondary flow patterns. The primary flow is essentially the slurry flowing down the spiral trough under the force of gravity. The secondary flow pattern is radial across the trough (Fig 3). This flow description is central to spiral separation theory. As the slurry film flows down the trough, the dense particles settles faster and are carried inward by the lower layer of the secondary flow, while the less dense particles stay on top of the dense materials and are then carried outward by the top layer of the secondary flow. This mechanism has been reported to take place mainly in the first three turns of the spiral. After this early separation, most of the water is found towards the outer edge and a band of dense material with a solids content upto 70 % is found to be close to the centre post, ready to be removed by an intermediate recovering device or a splitter at the end of the trough. Flow speed is trough design and operation dependent with reported values being in the range of 0.1 metre per second to 0.3 metre per second radially across most of the trough, with a more rapid stream found towards the outermost point. 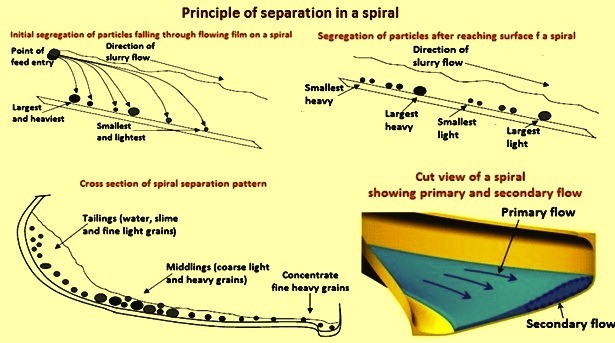 Spirals need addition of water at various points down the spiral to assist washing of the ore, i.e. transporting away the coarse light particles from the fine heavier particles of the ore. The amount of wash water and its distribution down the spiral trough can be adjusted to meet the operating requirements. Point control minimizes the total water requirements by efficiently directing water into the flowing slurry at the most effective angle. Feed size applicability is in the range of 0.3 mm to 1 mm. Spirals are normally operated at a slurry density of 25 % to 30 % solids. The shaking table is gravity separation equipment which has been in use since many years. Little has changed in the design, although multi-deck tables (upto three levels) have led to the capacity increases relative to floor area. Shaking tables are generally used only on cleaning stages since their capacities are usually low. The principle of separation is based upon the motion of particles according to their specific gravities and sizes moving in a slurry (in the case of wet tables) across an inclined table, which oscillates backwards and forwards essentially at right angles to the slope, in conjunction with riffles which hold back the particles which are closest to the deck. This motion and configuration causes the fine high specific gravity particles to migrate closest to the deck and be carried along by the riffles to discharge upper most from the table, while the low specific gravity coarser particles move or remain closer to the surface of the slurry and ride over the riffles, discharging over the lowest edge of the table (Fig 4). In the case of air tables, as the name suggests, the feed and separation are dry, with the moving bed of particles being fluidized by low pressure air being blown through a canvas deck, which together with deck slope, absence of riffles and the oscillating motion of the table causes fine light specific gravity particles to move to the top of the bed and coarser heavy specific gravity particles to move closest to the deck, the latter discharging off the lowest part of the table. Air tables for mineral processing were developed from the grain industry, and are generally adapted for specific uses where dry gravity separation is preferred over other methods. Typically this is used during the cleaning stages of a dry mill. The variables of air table include (i) as per wet tables (deck slope, stroke length, stroke frequency, splitters), and (ii) fluidizing air flow (increased flow maintains bed mobility up to a maximum). The air table is advantageous to use where the process before or after is dry since it eliminates the need for additional thermal drying. The advantages of shaking tables include (i) highly selective, with high upgrading ratio if used correctly, and (ii) ability to observe separation and to make adjustments. The disadvantages include (i) low capacity, (ii) large floor area requirements, (iii) needs frequent operator attention, checking and adjustment, and (iv) feed requires sizing. The desire for the higher use of gravity circuits and the need to recover finer particles have led to the development of specific devices to recover particles generally too fine to recover efficiently by using spirals etc. Two examples of these are the Falcon concentrator and the Mozley Multi Gravity Separator (MGS) (Fig 5). The Falcon concentrator is basically a combination of a sluice and a continuously operating centrifuge. It is capable of operating at a high speed of rotation and hence gravity force enables fine particles of different specific gravity to be separated. The shape of the spinning bowl is such that as the feed slurry moves up the bowl the heavier particles react more than the lighter particles to the forces acting upon them. This results in migration of the heavier particles within the slurry stream to the surface in contact with the bowl, while the lighter particles tend to move to the top of the slurry with the water. 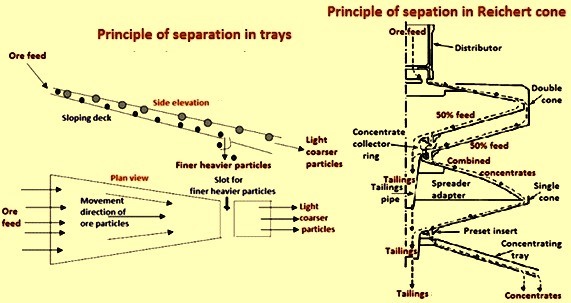 Separation then takes place by removal of the lower (higher specific gravity) portion of the slurry through a collection lip/slot, the flow through which is regulated by a number of orifices which open and close in a controlled manner, removing the concentrate from the main stream, which discharges to tailings. The variables for the Falcon concentrator include (i) speed of rotation or spin (increased spin raises gravity force and thus increases the separation force on the feed), (ii) pulse frequency of concentrate orifices (increased frequency to a maximum increases weight intake), and (iii) feed rate and density (increased rate and density above a certain maximum obstruct separation). The advantages of the concentrator are (i) able to treat particles in size which are in the range of 15 microns to 20 microns, (ii) relatively simple mechanical construction and robust in design, (iii) relatively high capacity, and (iv) relatively low requirement for the operator attention. The disadvantages include (i) normally low upgrading ratio (typically 2:1) , (ii) absence of the visibility of the separating surfaces, and (iii) needs feed to be screened to less than opening size of concentrate orifices to prevent blinding. The MGS is equipment for the separation of particles in fine size range. The MGS is suitable for the treatment of fines with a maximum particle size of around 0.5 mm. The principle of MGS can be visualized by rolling the horizontal surface of a conventional shaking table into a drum and rotating the same along the horizontal axis. This causes application of an enhanced gravitational force, many folds higher than the normal one, on the mineral particle flowing across the surface. This leads to improvement in the treatment of fine particles in comparison to conventional separator such as shaking table. As mentioned above, the MGS combines the centrifugal motion of an angled rotating drum with the oscillating motion of a shaking table, to provide an enhanced gravity separation, particularly suited to fine particles. 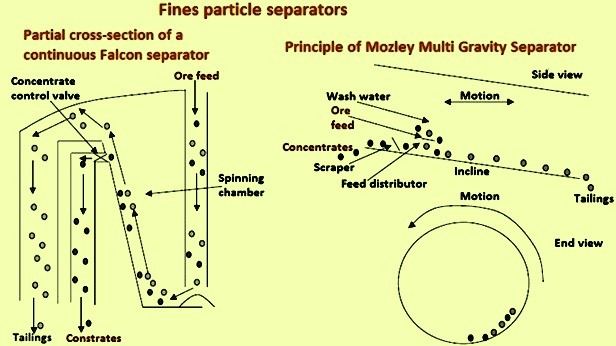 The principle of the separation in the MGS is based upon the above-mentioned forces which act on particles in a slurry stream being fed and are distributed onto the inside of the drum’s surface. With the aid of scrapers and wash water, the higher specific gravity particles migrate up the drum to discharge over the drum’s top lip, while the lower specific gravity particles flow in the opposite direction and discharge over the lower drum lip. The variables include (i) drum rotational speed or spin (increased spin increases the centrifugal gravity force imparted to the particles, making it more difficult for the particles to move up the drum, hence resulting in a smaller weight take and a cleaner concentrate), (ii) drum stroke length and frequency (increased length and frequency within limits tend to increase the forces moving the particles up the drum, resulting in a greater weight take and a lower grade of concentrate), (iii) drum wash water increases the washing of the slurry particles as they try to move up the drum, thus producing a cleaner concentrate, and (iv) drum tilt angle (increased tilt produces a cleaner concentrate). The advantages are (i) very selective separation with fine-sized particles (typically -75 microns to +10 microns), and (ii) high upgrading ratios (typically 20:1). The disadvantages are (i) low capacity for surface area and space, although larger capacity (and physically bigger) equipments are now available, (ii) mechanically quite complex and expensive, (iii) generally enclosed so unable to see separation surfaces, (iv) requires reasonable amount of operator attention, and (v ) not suited for treating coarse material (feed is to be screened). 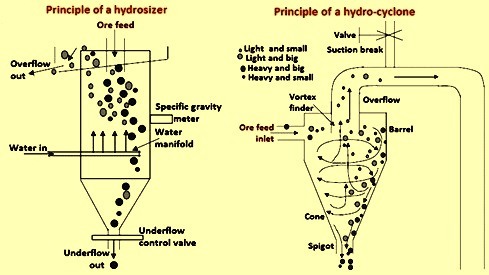 The following two examples of separators namely (i) hydrosizer, and (ii) hydrocyclone) are given. Their principles are shown in Fig 6. They represent more of sizing equipments than gravity separators. However because of their nature they also combine particle specific gravity with particle size in their separation. The hydrosizer is a development of the teeter column classifiers which uses the principle of particle settling to achieve a separation between fine/light particles and coarse/heavy particles in an environment of a rising flow of water in a tank generated by injection water through a manifold about two thirds of the way down the tank. This creates an overflow of the former, and an underflow of the latter. A particle of sufficient weight due to its specific gravity and size settles faster in a fluid than a particle of lower specific gravity and size. If there is a rising up-current of fluid then at a certain volumetric rate the up-current velocity exceeds the settling velocity of the lighter/smaller particles but not that of the heavier/coarser particles and a separation takes place. The variable are (i) injection water flow rate (increasing water flow rate increases the weight of particles and specific gravity/size of particles reporting to overflow), (ii) column density (increasing the specific gravity of the slurry contained in the column between the injection water manifold and the overflow weir increases the weight to overflow), (iii) underflow discharge (increasing the underflow discharge volume rate reduces the solids density of the column and tend to reduce the upward flow, thus reducing the specific gravity/size of the overflow solids), and (iv) mass flow rate of feed (increased feed rate above an optimum level reduces the sharpness of separation). The advantages are (i) precise automatic control of the separation based on specific gravity measurement of the column head in a control loop with the underflow valve, (ii) able to observe both products and make easy adjustments to control mechanism if required, (iii) no moving parts, and (iv) can be wet or dry fed. The disadvantages are (i) requires dedicated injection water pump which can deliver a clean, constant but adjustable supply, (ii) high water requirement, (iii) high volume for given capacity needed, and (iv) needs steady feed rate. Hydrocyclones create a separation between coarse/high specific gravity particles and fine/low specific gravity particles based on their geometry and the centrifugal motion of the flow inside them acting on the particles accordingly. When slurry is fed under pressure tangentially into the pipe shaped body of a cyclone, the centrifugal force tends to throw the heavier particles towards the outside in preference to the lighter ones. The outer particles then move down the cone under pressure and are forced out of the underflow spigot, while the lighter particles (and water) on the inside of the vortex rise up into the vortex finder and discharge as an overflow. The variables are (i) feed pressure (this is the driving force behind the separation, such that the greater the pressure, the finer the size separation achieved), (ii) vortex finder diameter (the greater the diameter, the larger the overflow and the lower the pressure, hence the separation is coarser), (iii) spigot diameter (likewise, the greater the diameter, the larger the flow so the underflow is finer or wetter), variable spigots can be used, (iv) siphoning (if the overflow discharges lower relative to the underflow a siphon effect occurs causing increased solids and flow to overflow which is overcome by introducing a vacuum break), (v) feed density (if the density is too high: typically above 35 % solids then separation is affected), (vi) angle and length of the cone section (increased length and shallower angle reduces the cut size), and (vii) barrel diameter (the larger the diameter, the greater the capacity, the lower the pressure and the coarser the cut size). The advantages are (i) high capacity for the volume and floor area required, (ii) no moving parts, and (iii) limited operator attention. The disadvantages are (i) not easily adjustable for changing feed and product requirements, and (ii) need to be fed under pressure and at a steady rate.